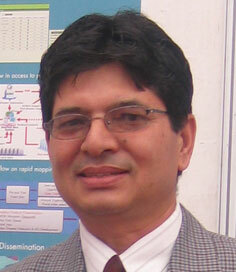 Mr. Joshi is a life member of Nepal GIS Society and currently he is the General Secretary of the Society. He has recently completed his 32 years regular service at ICIMOD. After his retirement from the regular job, currently he is involving as a consultant at ICIMOD in a position of Programme Coordinator for Reconstruction and Rehabilitation Programme of Resilient Mountain Village (RMV), under Strategic Cooperation Unit. Prior to joining ICIMOD, he served in Topographic Survey Branch of Nepal as an Asst. Cartographer for more than eight years. He has Diploma in Cartography from Switzerland, and tailor made training courses mostly in the field of Basic Survey, Topographic Survey, Junior and Senior Surveyor’s Courses (Four years) from Nepal. In addition he has completed two months long GIS and RS Training from ICIMOD and 5 weeks advance GIS training from ESRI, USA, and two weeks RS training from AIT, Bangkok. He is awarded with ‘Spirit Award’ on Excellent Work in the year 1997 from ICIMOD management, and Participatory Mapping Award 2009 from CTA,The Netherlands. His fields of expertise areP3DM, GIS, and RS. He has published more than a dozen publications including training manual on Participatory 3 Dimensional Models (P3DMs), Surveying and Capacity Building from ICIMOD. He is also an active professional member of Subject Committee Member of School of Engineering, KU, Life Member of Nepal Remote Sensing and Photogrammetry Society, RR Library, Member of Nepal Survey Association.